A major component of an encapsulated crawl space is the installation of a high-quality vapor barrier that keeps your crawl space dry and reduces heat loss. 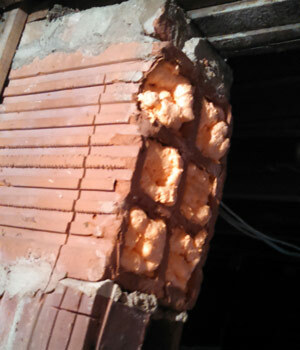 Vapor barriers slow or block the evaporation of ground moisture into the crawl space air. More moisture enters your crawl space than most homeowners ever realize. We are not talking pints or quarts. Hundreds of gallons of groundwater per year find its way into your home. 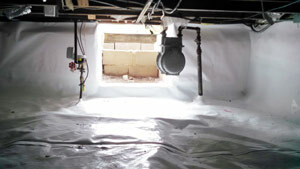 A professionally installed crawl space vapor barrier will stop this intrusion. When a vapor barrier is part of a comprehensive waterproofing system, moisture and water are kept out of your crawl space. It is the easiest preventative way to avoid a host of problems. Encapsulation puts your crawl space on autopilot, free from maintenance and worry. Crawl space encapsulation is like building a fortress underneath your home - protecting your home and your family against underground invasions of water, bugs, or critters and stopping a prime potential source of dangerous mold and fungi growth. For a vapor barrier to remain effective over many years, it must be durable. Crawl Space Solutions By Cowleys uses a crawl space liner that is as tough as nails. Made of a 20-mil 7-ply sandwich of high-and low-density polyethylene with polyester-cord reinforcement and treated with an antimicrobial finish that protects against mold and mildew growth, this made-to-take-a-beating liner is puncture and tear resistant. Standard liners are only 6 mils, the same thickness of the typical lightweight blue tarps found in most retail or hardware stores. They are thin, easy-to-tear and typically crumble and disintegrate in a short period of time. In comparison, our liner, at more than three times the thickness, and is made to last. It is also UV resistant. If going through the trouble of installing a vapor barrier, do it right the first time. Avoid the worry about whether your liner has been torn, exposing soil and moisture.